That is, novels and short stories set in a parallel universe whose history has somehow diverged from our own. It’s an old, old genre; you can find a seemingly complete and well-annotated bibliography at this website, plus a good discussion at this Wikipedia page. Honest to goodness reputable, professional, tenured historians have even gotten in on the fun. See, for example, Virtual History: Alternatives and Counterfactuals, complete with a helpful introduction by the book’s editor, Niall Ferguson (who also contributes his own counterfactual—in which the British never entered WWI—that dovetails nicely with his revisionist study of that conflict, The Pity of War). While he has also published a translation of the Chronicles of Theophanes the Confessor, an 8th century Byzantine monk, and writes fantasy and science fiction stories (sometimes under pseudonyms), Turtledove is certainly best known for his many alternate histories. He has won two Sidewise awards (the leading honor in the genre; and several of his books preceded the creation of the award) and another two honorable mentions in that competition. One for a pretty silly collaboration with actor Richard Dreyfuss (!) called The Two Georges, in which Martin Luther King, Jr. is the governor-general of the country created when George Washington struck a deal with King George III. 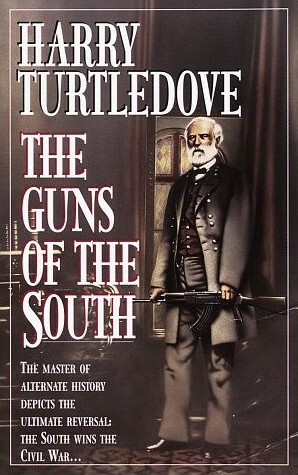 I’d absolutely recommend his novel that crossed over most successfully to the mainstream, The Guns of the South. Its cover pretty much gives away the counterfactual before the writer can even reveal it, though you’ll never guess just how Gen. Robert E. Lee got his hands on an AK-47. As with most of Turtledove’s novels, TGOTS features a healthy dose of combat scenes. But this one is most successful because it simultaneously pushes back against the revisionist historians who poke holes in Lee’s “marble man” image and eviscerates the Confederate “Lost Cause” myth by teasing out the inherent contradictions that would have torn apart even a hypothetically victorious Confederate States of America (CSA) after their “War against Northern Aggression” (as my first undergraduate advisor at William and Mary called it—semi-jokingly). Recognizing that alternate history in general and Turtledove’s work in particular can be something of an acquired taste, I’ll instead suggest that you start with Agent of Byzantium, a 1987 collection of short stories that are (a) well, short, in case you decide the genre’s not for you, and (b) fairly non-fanciful. In fact, they follow from the author’s professional training, and that expertise is clear. Few other fiction writers could convincingly create and people an imagined past in which Muhammad converted to Christianity and became one of the Church’s great hymn-writers (“There is no God but the Lord, and Christ is His son” goes the most famous lyric of this “St. Mouamet”) and the Byzantine Empire remained a powerful force well into the 14th century. Featuring a soldier-turned-spy named Basil Argyros, each story adds a further counterfactual twist, usually in the form of a technological innovation (innoculation, moveable type, the telescope) breaking through differently than it actually did. It can start to feel a bit formulaic, but the stories are eminently readable. And as someone who teaches a church history survey, my heart is strangely warmed by any spy story that turns on the hero blowing his cover because he stays silent during the Filioque clause of the Nicene Creed. 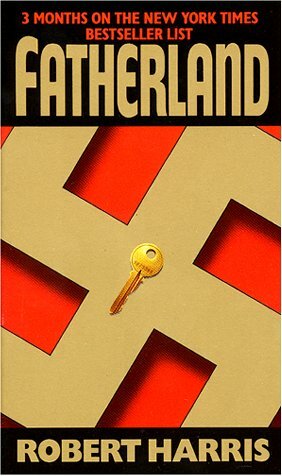 Turned into a decent HBO movie with Rutger Hauer and Miranda “Rita Skeeter” Richardson, Fatherland was Harris’ first published novel and remains his most popular and (in my semi-informed judgment) best. It takes place in an alternate timeline during which multiple variables changed to permit Nazi Germany to vanquish the Soviet Union, consolidate its hold on Europe, and wage cold war against the United States: Reinhard Heydrich is never assassinated; the Wehrmacht breaks through in the Caucasus; and the Germans realize that the British cracked their U-boat code. (Harris’ book about Enigma is a straightforward historical novel that became an unsatisfying film despite its Tom Stoppard-authored screenplay.) Otherwise, the Fatherland universe parallels our own, with the onset of the Cold War, the founding of the European Community, and Beatlemania all showing up in slightly tweaked fashions. As a postscript taking us beyond the book-reading theme into my preferred mode of TV-watching… You can create a cool double-feature by pairing the HBO adaptation of Fatherland with an installment or two of Inside the Third Reich (the epic 1982 miniseries on the life of Hitler’s architect, Albert Speer, played by, ta dah!, Rutger Hauer) or the 2001 HBO movie Conspiracy, a dramatization of the transcript of the Wannsee Conference (which is at the heart of the Fatherland mystery). Or better yet, track down the original German film from the same source. To this point, I haven’t recommended anything I would seriously propose as a great novel (or short story). Competent, compelling, imaginative… But genre fiction. Don’t get me wrong: I love genres. Three-camera sitcoms. Twelve-bar blues. The fourteen lines of the sonnet. I admire artists who challenge themselves to work within the confines of convention and expectation; creativity need not be ex nihilo just because Creation was. Michael Chabon would certainly agree. In an odd turn for a young writer whose first three novels had won universal acclaim and Hollywood deals, he professed himself disinterested in contemporary fiction and started to write genre fiction. But while many people write Sherlock Holmes pastiches, adventure stories, and alternate history, I’m not sure if anyone else does all three within the space of three years. And certainly not as distinctively or successfully as Chabon. 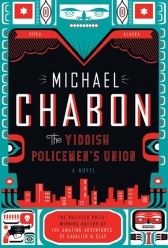 Having liked The Final Solution and Gentlemen of the Road (the latter enlightening me as to this fascinating piece of Jewish history), I happily picked up The Yiddish Policemen’s Union and found myself unable to put it down until I finished it the next day. I suppose I should begin with the root counterfactual, though I fear that it might seem so obscure or outlandish as to stop some from reading on… In 1938 US secretary of the interior Harold Ickes suggested that Jewish refugees from Nazi Germany be given safe haven in the then-territory of Alaska. In real life, the resulting proposal (the Slattery Report, named after Ickes’ deputy) went nowhere. (Check out the Anchorage Daily News‘ 1999 series on the actual Slattery Report.) In Chabon’s alternate history, the Alaskan delegate to Congress who helped derail the proposal died in a car accident, and the city of Sitka, Alaska became a Jewish metropolis, while the state of Israel proved to be short-lived. The story picks up with the land given to the Jewish refugees scheduled to “revert” to the United States, prompting a new diaspora of Sitka Jews like the protagonist, a detective named Meyer Landsman. A further pleasure (for the most part) of this book is the way it immerses the reader in Judaica. Chabon pays particular attention to Hasidism, reminding me that I had not read Numbers 19:2 recently, and certainly not with the same hermeneutic as certain Jewish Messianists or millenarian Christians. Yet interesting as that culture is, Chabon’s trail derails as his story becomes more and more a wild-eyed conspiracy implicating Zionists and conservative Evangelicals and less and less a study of diverse characters living in his breathtakingly well-imagined past. But before things get out of hand, you’ll have enjoyed three hundred pages of the best alternate historical hardboiled detective novel yet written!